Backed by rich industry experience, we are manufacturing, supplying and trading Roman Chair with Hipper Extension. We offer their ranges in distinctive styles that perfectly match with the needs of our customers. Apart from this, our products are cost-effective in rates and easily comes into the budget limit of clients. 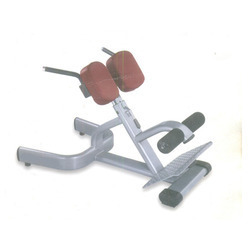 We are leading importer & distributor of Roman Chair strength machines (kobra series).